A sickness spreads across the Earth and it may very well be attacking the natural ways were are to interact with each other. Does anyone recall knowing about, "Love your neighbor as yourself"? Try some today and always, then maybe, just maybe those who overlook, turn away and/or otherwise only help others for profit/gain/control will get the idea of what is natural and correct for us as humans. We ARE NOT animals by the way! The stories below share some of what Europe faces with "The Houseless". Many Houseless die each day from living in the harshness of street life. Are you one of those who passes by The Houseless rationalizing and/or justifying why it doesn't concern you? 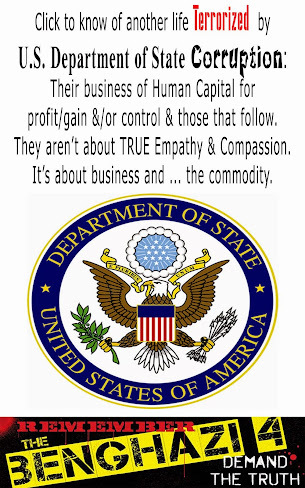 If you have children or are planning to, will wrong rationalization/justification of not being about it when it comes to actually invoking true compassion be the norm? Consumers pass by The Houseless. People going to work pass by The Houseless. The young do as well, and so don't those who actually profess to know the difference from right from wrong, yet for some reason are able to convince themselves to not be righteous. 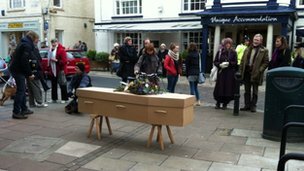 The coffin of a man who died in an alley in Totnes is to be taken through the streets to highlight homelessness. Michael Gething, 42, died while sleeping in an alleyway beside the town's Methodist Church. It is believed he died of hypothermia. He is the fourth homeless person to die in the town in 2012, undertaker Rupert Callender said. He added that the carrying of the coffin next week would be a "a simple way" for people to come together. Mr Gething came to the town about 18 months ago. Graham Walker, who used to be homeless in the area, said "a simple thing that could save lives" was needed. He said: "He died on the street. I think that, as a community, we should be aware of that fact and acknowledge it, and do something about it. "He would be alive today had there been a shelter in Totnes." Mr Gething's funeral is due to take place next week. Mr Callender, who is organising the funeral free of charge, said 6ft 4in (1.93m) man was "very visible" and had "something about him which was very approachable". He said: "His life and his death were on the streets, his funeral should be on the streets as well. 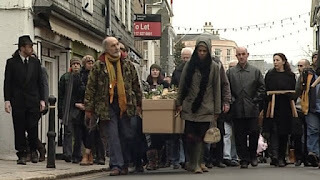 "The act of carrying his coffin all the way up the hill to Follaton Cemetery is quite a physical commitment, so we're going to need the help of the townspeople. "This is a simple way for people to come together and show respect and solidarity. "It would be nice to see a night shelter come out of this." South Hams District Council has the responsibility for looking after homeless people in Totnes. The authority said it was very sad about the recent deaths of rough sleepers. It added it was looking for premises with a view to setting up a night shelter or hostel in the town. And, the story below covers Mr. Michael Gethings' funeral. By the way, he was human in case you care! The coffin of a man who died while sleeping rough on the streets of a Devon town has been carried by local people during his funeral. Michael Gething, 42, died near the Methodist Church in Totnes. It is believed he died of hypothermia. Mr Gething is thought to have been living in the town for about 18 months. 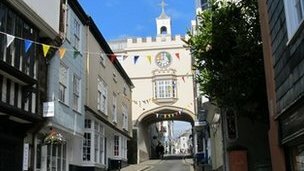 South Hams District Council said it would be assessing whether any premises in Totnes might be suitable for a shelter or hostel. Local undertaker Rupert Callender, who arranged the funeral, said: "I hope people might put their judgements aside about what life on the streets is like, and what people who live on the streets are like. "I hope they can see that they are ordinary people who have fallen on hard times." Jonathan Taylor, who took part in the funeral proceedings, said: "There is a sense that this is a really important community event." Melissa Worsley, who lives in Totnes, said people such as Mr Gething "are part of the community and we should look after them". She added: "If they can't cope with society they still have the right to be looked after." Earlier in the week Graham Walker, who used to be homeless in the area, slept out for 48 hours to raise funds towards Mr Gething's funeral. Mr Walker said: "He died on the street. I think that, as a community, we should be aware of that fact and acknowledge it, and do something about it." South Hams Council said it was saddened by the death of Mr Gething, adding he had been offered advice, assistance and accommodation on several occasions. It added: "Unfortunately, accommodation is not always available in Totnes and sometimes it may be offered in nearby towns. "A place was offered to Mr Gething in a supported accommodation unit in Dartmouth, known as St Barnabas, but he did not take up the place." The council added that, in the event of severe weather, it had an emergency protocol in place which sought to ensure people living on the streets were offered help and accommodation.